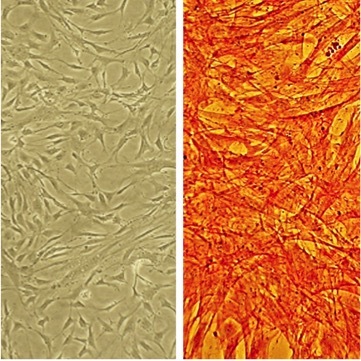 (Click to Enlarge) Bovine Pulmonary Artery Smooth Muscle Cells, BPASMC (L) immunolabeled for smooth muscle-specific alpha-actin using ABC method (R). Chowdhury, A., J. Sarkar, P. Pramanik, T. Chakraborti, S. and S. Chakraborti. 2016. Cross talk between MMP2-Spm-Cer-S1P and ERK1/2 in proliferation of pulmonary artery smooth muscle cells under angiotensin II stimulation. Archives of Biochemistry and Biophysics, 603:91–101. Chowdhury, A., S. Nandy, J. Sarkar, T. Chakraborti and S. Chakraborti. 2011. Inhibition of pro-/active MMP-2 by green tea catechins and prediction of their interaction by molecular docking studies. Molec Cell Biochem, DOI 10.1007/s11010-016-2903-y. Sarkar, J., S. Nandy, A. Chowdhury, T. Chakraborti and S. Chakraborti. 2016. Inhibition of MMP-9 by green tea catechins and prediction of their interaction by molecular docking analysis. Biomed & Pharmacother, 84:340-347. Sarkar, J., A. Chowdhury, T. Chakraborti and S. Chakraborti. 2016. Cross-talk between NADPH oxidase-PKCα-p38MAPK and NF-κB-MT1MMP in activating proMMP-2 by ET-1 in pulmonary artery smooth muscle cells. Molec & Cell Biochm, 415:13-28. Chakraborti, S., A. Chowdhury and T. Chakraborti. 2015. Cross-talk between p38MAPK and Giα in regulating cPLA2 activity by ET-1 in pulmonary smooth muscle cells. Mol Cell Biochem, 400: 107. Chowdhury, A., J. Sarkar, T. Chakraborti and S. Chakraborti. 2015. Role of Spm–Cer-S1P signalling pathway in MMP-2 mediated U46619-induced proliferation of pulmonary artery smooth muscle cells: protective role of epigallocatechin-3-gallate. Cell Biochem & Function, 33:463-477. Rahaman, S., K. Dey, T. Chakraborti and S. Chakraborti. 2015. Angiotensin II inhibits Na+/K+ATPase activity in pulmonary artery smooth muscle cells via glutathionylation and with the involvement of a 15.6 kDa inhibitor protein. Indian J Biochem & Biophys, 52:119-124. Chowdhury, A., S. Roy, T. Chakraborti, K. Dey and S. Chakraborti. 2014. Activation of proMMP-2 by U46619 occurs via involvement of p38MAPK-NFκB-MT1MMP signaling pathway in pulmonary artery smooth muscle cells. Molec & Cell Biochem, 385:53-68. Rahaman, S., K. Dey, P. Das, S. Roy, T. Chakraborti and S. Chakraborti. 2014. Identification, purification and partial characterization of low molecular weight protein inhibitor of Na+/K+-ATPase from pulmonary artery smooth muscle cells. Molec & Cellular Biol, 393:309-317. Chowdhury, A., S. Roy, T. Chakraborti, K. Dey, and S. Chakraborti. 2013. Activation of proMMP-2 by U46619 occurs via involvement of p38MAPK-NFκB-MT1MMP signaling pathway in pulmonary artery smooth muscle cells. Molecular and cellular biochemistry:1-16. Roy, S., T. Chakraborti, A. Chowdhury, and S. Chakraborti. 2013. Role of PKC-α in NF-κB–MT1-MMP–mediated activation of proMMP-2 by TNF-α in pulmonary artery smooth muscle cells. Journal of biochemistry. 153:289-302. Shaikh, S., J. Sarkar, A. Pramanik, K. Karmakar, and S. Chakraborti. 2013. Effect of m-calpain in PKCα-mediated proliferation of pulmonary artery smooth muscle cells by low dose of ouabain. IJBB. 50:419-427. Dey, K., S. Roy, B. Ghosh, and S. Chakraborti. 2012. Role of protein kinase C in phospholemman mediated regulation of α2β1 isozyme of Na+K+ ATPase in caveolae of pulmonary artery smooth muscle cells. Biochimie. 94:991-1000. Roy, S., K. Samanta, T. Chakraborti, A. Chowdhury, and S. Chakraborti. 2011. Role of TGF-β1 and TNF-α in IL-1β mediated activation of proMMP-9 in pulmonary artery smooth muscle cells: Involvement of an aprotinin sensitive protease. Archives of biochemistry and biophysics. 513:61-69. Chakraborti, S., A. Chowdhury, P. Kar, P. Das, S. Shaikh, S. Roy, and T. Chakraborti. 2009. Role of protein kinase C in NADPH oxidase derived O2(*-)-mediated regulation of Kv–LVOCC axis under U46619 induced increase in [Ca2+] in pulmonary smooth muscle cells. Archives of biochemistry and biophysics. 487:123-130. Suzuki, Y.J., H. Nagase, C.M. Wong, S.V. Kumar, V. Jain, A.-M. Park, and R.M. Day. 2007. Regulation of Bcl-xL expression in lung vascular smooth muscle. American journal of respiratory cell and molecular biology. 36:678.